For years I have been referring to the Garda Ombudsman as a “paint job.” I have done so out of my extensive experience of them, with regard to the various individuals, activists and organisations I have worked with. I have seen complaints accompanied by incontrovertible evidence of garda criminality result in garda vindication and vilification for those who dared to complain. The Garda Ombudsman was set up to allegedly replace the Garda Complaints Board. The gardaí investigating the gardaí was seen to be a process that facilitated the widespread abuse of power and criminality by members of An Garda Síochána. The new body was spun in the media as being an organisation that would employ the best of experts from all over the planet to rein in the endemic corruption of the gardaí. And spin is all that it was. It has been my experience that the Ombudsman only examines the admissibility of complaints. The actual investigative work is handed back to the Garda Síochána as is facilitated by the Garda Síochána Act. In other words, the gardaí are still investigated by the gardaí. The only real difference is the addition of a massively expensive buffer between complaints and alleged investigations. I won’t be going into the function of the DPP in all of this. But I must say that I’m tempted to! On June 9th of this year the Irish Times published a piece based on the statistics for 2010, concerning the operation of the Garda Ombudsman. I’m not too concerned with most of the figures produced as they give no inclination whatsoever as to whether the Garda Ombudsman is functional. I’ll deal with the second point first as the other point will form part of the backdrop of this whole piece. According to the Irish Examiner on January the 11th 2010, the EU in a report had said that “Sub-Saharan Africans are twice as likely to be subjected to police stops than other members of the public.” In fact the stop rate for these minorities was the highest in the EU, with Greek police stopping members of the Roma coming second. In March of this year the High Court removed Section 12 of the Immigration Act. This allowed the gardaí to stop non-nationals and demand that they produce their passports or similar documentation, without any reasonable suspicion that the person concerned had committed an offence. The gardaí were using and abusing this power. I’m personally aware of lots of instances of this and have been involved in a number of cases where the gardaí failed to secure a single conviction. To suggest that the Ombudsman had not detected a trend indicating racism shows a lack of investigative ability and literacy rather than showing a lack of racism. Now back to those figures. 2,258 complaints for 2010. Those figures, we’re told, are broadly in line with the figures of 2009. The Ombudsman has been open for business a little over four years. Let’s say the Ombudsman receives 2,200 complaints per year. Over four years this is 8,800. In November of 2009 our glorious leader, Enda Kenny, asked a parliamentary question about the budget for the Garda Ombudsman. He was told that the budget for 2008 had been €9.845 million. He was told that the budget for 2009 would be €11.058 million. I’m going to take the average budget to be approximately €10 million per year. In other words, the Garda Ombudsman has spent €40 million to remove the scum from An Garda Síochána. In May of this year I had a parliamentary question asked by Joan Collins (Many thanks Joan). I wasn’t interested in how the Ombudsman “disposed” of complaints. I reckoned they used a bin. I wanted to know how many convictions had been secured, due to their efforts, that hadn’t been overturned by appeal. And I wanted to know the rank of the most senior garda convicted. Getting my answer took a bit longer than the three days it’s supposed to take. The reply came on the 30th of August. 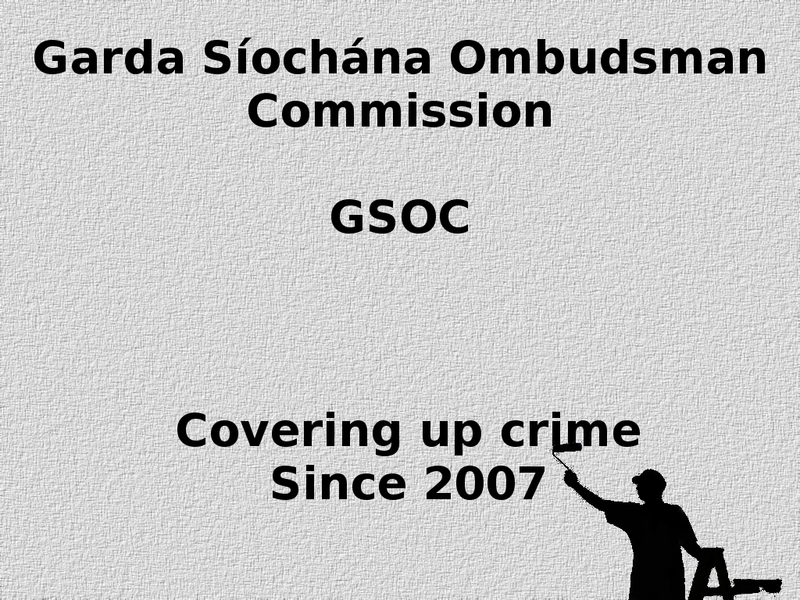 “Since commencement of its operations in May 2007, seven members of An Garda Síochána have been found guilty of offences by the Courts arising from investigations by the Garda Síochána Ombudsman Commission. Of these, two members had their verdicts reduced to a sanction under the Probation of Offenders Act 1907 (as amended). In a further case, in the District Court, the judge found that while the Garda in question had assaulted a complainant it was a minor assault at the lower end of the scale and he decided that he would deal with it other than by imposing a conviction and so struck out the summons. So there you have it. There have been 5 convictions since the Garda Ombudsman opened for business. The two that were given the Probation Act were not convicted, that is the point of the Act. 8,800 complaints and 5 convictions. 1 conviction per 1,760 complaints. €40,000,000 for 5 convictions. €8,000,000 per conviction. The Garda Ombudsman is the most expensive paint job in Irish history. With the possibility of securing a conviction based on any single complaint being less than 0.057% it is quite obvious that one is better off not making the complaint in the first instance. For ordinary citizens the message is quite clear. Avoid the Ombudsman. I could suggest that the Ombudsman exists specifically to ensure that the gardaí do not suffer for their widespread criminality. But that’s irrelevant, the intent that is. The fact is that they do not suffer for their widespread criminality. For activists, the picture is even bleaker. The fact that the ombudsman does not function is used to tarnish the names and credibility of activists. And it would be my advice that activists and groups initiate a policy of not utilising the Ombudsman to begin with. It’s a waste of time and we can do without the State and other cancerous groups and individuals using this paint job to marginalise and disenfranchise us.